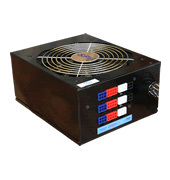 The Sparkle Power MAGNA series of power supplies are machines. The slick looking, black finished, cost effective, 1200W power supply cuts no corners in performance. With a Universal AC input and Active Power Factor Correction you will enjoy a best in class 80PLUS (BRONZE) certified power supply with it\'s high efficient design. The SLI ready MAGNA series with its modular cables will allow you the freedom to design your new gaming or high powered system with a clean, clutter free wiring solution. The noise killer thermal fan control function will keep your work area quite as you focus on your important or fun activities. The MAGNA 1200W has 6-12V rails to support multiple graphic cards and all your current and upgraded peripherals.